The watch industry is one in which players make slow, calculated moves, and Jean-Claude Biver’s first as the new head of the LVMH Watches & Jewelry division was to place Aldo Magada as president and CEO of Zenith. The appointment isn’t so surprising. The two men have been rubbing shoulders ever since their partnership saved Omega in the 1990s. Zenith’s throne is a “dream” position, said Aldo Magada, and one he’s been preparing for his entire career. After more than three decades in the industry, working with brands across the board, he tells us why he’s finally ready to cross paths with Jean-Claude Biver once more, and explains their shared vision for Zenith’s future. Your arrival at Zenith was announced shortly after Jean-Claude Biver’s appointment as the head of the watches division at the LVMH group. The two of you have known each other very well since your days at Omega. How beneficial is this reunion for Zenith? AM: I joined Jean-Claude Biver as vice president of marketing for product communication at Omega, and I’ve been close to him ever since. The way we work has never changed. He has always had that same entrepreneurial attitude, ever since he sold Blancpain to the Swatch Group Ltd. That was before he started working for Omega [also Swatch Group]. So I was working with a man who loved the brand and who wanted to put the brand back on the map. We shared that common goal, so working with Jean-Claude was incredible. Not only does he have the qualities of a gentleman, but his vision is also unique. He sees an issue in a way that most people can’t even imagine. He’s also a great partner to work with. He is always challenging you, and that for me proved to be great training before the upper echelon. After Omega, you worked closely with several brands such as Gucci, TechnoMarine, and Breitling. How did these experiences shape you, and what can you take from them into your new role at Zenith? AM: After a first experience as Head of Watches at Gucci, I joined TechnoMarine. It was more as a consultant than as a member of the company. But for me it was the only way to see what it was like working with a startup. And with Reuge and Badollet, it was exactly the same kind of thing. The only problem was sometimes you have to work with people to finance a project and that was a painful experience. But it’s always an experience. It was interesting to see how you have to manage a small startup company to try to succeed because you don’t have the power that a Gucci, a Prada, or an Omega brand has. So it was interesting for me to look at another side of the business and it was the first time I was in control of the situation. AM: You’ll be in control once more at Zenith, but this time, you will be backed by LVMH, another large group. That must be very exciting. Working for Zenith is a dream for anyone in this industry. It’s one of the very few true manufactures in Switzerland, and it’s a great brand. It’s still a small company but it has a lot of potential. As a manager, I’d have to say it’s interesting because it is still scaled at a human level. We have 270 people working in-house and another hundred outside. As a marketer it’s a great challenge to make sure that people can hear our message. The vision is that one-day, people will know about Zenith before the marketing campaigns even reach them. Now to work once more with Mr. Biver, I have to say, is another luxury for me. Of course, he’s more mature and I’m more mature, and we have also built a trusting and informal relationship today. And it’s easier for me because I’m working with one of the most knowledgeable people in the industry. I’m very proud to be a part of LVMH. It’s an incredible shareholder to have because it is respectful of the brands, of course. LVMH wants real growth, not fictitious growth. When we need help, financial or otherwise, it’s definitely a plus to have the premier luxury financial group in the world by our side. Having settled into your new role, what are the objectives that you are setting for yourself and the brand? AM: At a brand like Zenith, the CEO is serving the brand, and not the other way around. So the strategy that the brand currently has won’t be changing. Mr. Jean-Frédéric Dufour [Zenith’s former CEO] did a terrific job with the manufacture and did a terrific job restoring Zenith’s place on the market. But as a brand, we are now looking towards the next phase of our evolution. Because of my background in product development, I can really help the management community here to push the brand and the vision Jean-Claude Biver and I share. The backing of the group will of course allow us to move forward. Of course, we are talking about increasing the turnover; we are talking about the image of the brand, and brand awareness. But what’s the most important is customer satisfaction, and the many years that follow the purchase of a Zenith watch. I’m concentrating on maximizing this aspect of our service. If you were one of those customers, which models would you currently pick from Zenith’s collection, past or present? AM: There are a lot of incredible watches in the Zenith collection of course, but the watch that stands out, apart from the Haute Horlogerie pieces such as the Christopher Columbus, has to be the Zenith El Primero Chronomaster 1969. It’s the quintessential Zenith, because it combines the work of Thierry Nataf (another former Zenith CEO) with the modern twist that is the opening on the dial. And it has a great classical case, which was made by Mr. Dufour. It’s a great synthesis of what Zenith is about. Zenith is about movement; Zenith is about design; Zenith is about heritage. Besides having such a rich past to draw from, Zenith is also exploring new territory with contemporary partnerships with Felix Baumgartner, the Rolling Stones, and Russell Westbrook all featuring limited edition models in recent years. Will we see more of that in the future? AM: We’ve always featured on the wrists of the adventurous, whether it be on Louis Blériot, the first person to cross the channel, or even Mr. Mohandas ‘Mahatma’ Gandhi, who also wore a Zenith. And we will definitely continue to do so. We are now looking for new possibilities with people who are defining the future. We also continue to work with and celebrate the Stones because it’s important for us to be with someone such as the Rolling Stones. These guys are classic because they belong to the music history, but are definitely not traditional. And Zenith is exactly like that in regards to the history of watchmaking. And where do you see it in the future of that industry? 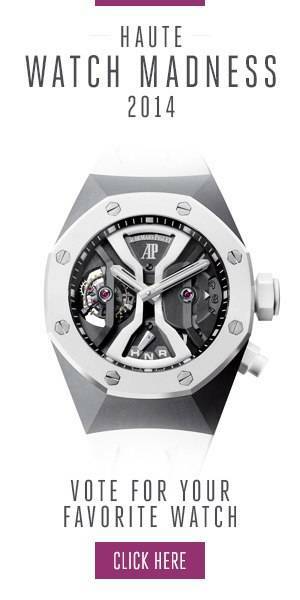 AM: Well, I cannot share specifics, but Zenith is the leader of the high-frequency chronograph. And I would like Zenith to be the number one destination for people who are looking for a mechanical watch priced between $6,000 to $20,000.